Each year the Australian wine industry organises tastings for the UK’s press and wine trade around ‘Australia Day’, 26th January. As part of the 2018 programme, wine writer Sarah Ahmed and winemaker for Lenton Brae, Ed Tomlinson, presented a tasting of Chardonnay wines from the Margaret River region of Western Australia. Margaret River is undoubtedly a premium wine area, renowned for Cabernet Sauvignon, Semillon/Sauvignon Blanc blends and Chardonnay. It’s a remote region, over 2,000 kilometres from Adelaide, the centre of the South Australian wine industry, that was first planted barely 50 years ago. In the mid 1980s there were 13 producers, but the growth and success since then sees more than 150 producers who call Margaret River home today. Ed puts the rapid success down to ambition, but also the appliance of science in understanding their gravelly and sandy soils, clones and planting. Sarah comments that she finds an intellectual rigour among the winemakers, promoting plenty of open discussion. When Decanter magazine declared the 1980 Art Series wine from Leeuwin Estate as the best Chardonnay in the world it helped focus both winemakers and consumers on the potential for the variety in Margaret River. 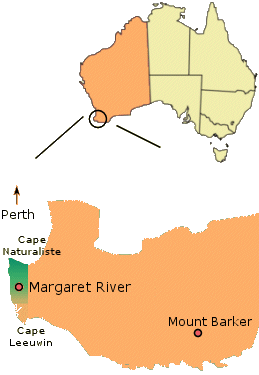 Many winemakers believe the Gin Gin clone of Chardonnay is key to this, as well as the combination of Mediterranean climate with a big ocean influence, Margaret River being on a peninsula surround on three sides by water. Gin Gin is a clone that suffers from millerandage, also known as ‘hen and chicken’, where berries ripen to an unequal size. I’ve heard winemakers in other regions speak very positively about this ‘problem’, because the small ‘chicken’ berries have intense flavour and very good acidity. Ed makes the comment that he believes Gin Gin needs longer to fully ripen, leading to slightly higher alcohol, so he likes to blend some other French clones that achieve ripeness at slightly lower alcohol. Four of the eight wines presented in this tasting come from 2016, “a very solid vintage: very good on the scale of good to excellent,” according to Ed. Overall, quality was extremely high and did indeed show the region’s capacity for Chardonnay that acheives high levels of sweet fruit ripeness, but produces wines with excellent balance and restraint. (2018) From an estate-grown single vineyard, and predominantly from the Gin Gin clone. The wine was barrel fermented and aged in a mix of new and used French oak. Very discreet, just gentle spearmint and toast but the fruit fresh and pristine. Juicy and firm on the palate, the acid is the spine of this, apple and taut and fresh salt and mineral flavours persisting into a balanced finish. (2018) Made from the Gin Gin clone, this spend 10 months in new and older French oak, both barriques and larger puncheons. Mealy and almondy, a touch of roasted orange, lovely nuttiness and a touch buttery. Ripe and full, on the palate - much more so than the Lenton Brae - verging on the tropical, but still with gorgeous acids. Stockist and price quoted at time of review is single bottle equivalent, but available only by the case. (2018) From a single block of old Gin Gin clone Chardonnay on clay/loam soils that retain moisture and need little irrigation. Again this was whole-bunch pressed into larger French oak barrels and fermented with wild yeast. It spent 10 months ageing in barrel (40% new). Much more obvious Brazil nut oak, but also a little bit of flinty reductive character. Lovely palate, the acid powerful and intense, but a hugely decisive wine without losing fruit or charm. Lovely wine from a winery that does not own vineyards, but sources this fruit from the cooler South of the region. Note stockist and price quoted is for 2015 vintage. (2018) Heytesbury is a selection of the best vineyards and fruit. 100% Gin Gin, the recipe again was for pressing straight to barrel and fermentation with wild yeast. Lees were stirred regularly during nine months ageing in 57% new French oak. Subtle wild ferment earthiness and nuttiness, a juicy directness, firm and acidic, it stays quite grippy and intense, but very good fruit. This has length and a good balance and certainly the fruit and infill of creamy oak to give lovely balance. (2018) Though pressed straight to French oak barriques (50% new), this was inoculated with selected yeasts and did go through malolactic fermentation during its 18 months in barrel. It still has nice earthiness and a nicely 'dirty' component, a suggestion of real savouriness to come and something of an orange fruit character. The palate has plenty of that meaty umami character, there's juiciness and a touch of toast, but a long, dry and savoury wine. (2018) This is the only wine that see 100% new oak, all French and all small barrels. 100% Gin Gin fruit is given some skin contact, with some barrels fermented with wild yeasts, others inoculated, spending a further 11 months in barrel, Lovely delicate perfume here, gentle creamy and almond oak influence, a touch of mint. The palate has ripe fruit in a nice mid point between sparky, juicy, tingling acid and a hint of the tropical as the fruit tightens up to mint and lime leafy juiciness.